A wedding checklist is something that you need to have in order to make sure that you are keeping your entire wedding organized. There are plenty of things that one has to go through in order to make sure that their wedding goes down in exactly the fashion that they have been hoping that it will. 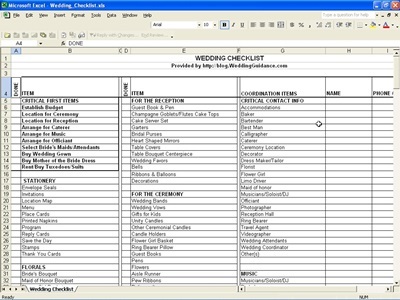 The best way to do this is by creating such a wedding checklist on the computer. Primarily the best program to use for creating this type of checklist is the Excel program. It is often used for calculating financial figures, and it can also be used as a wedding checklist as well. 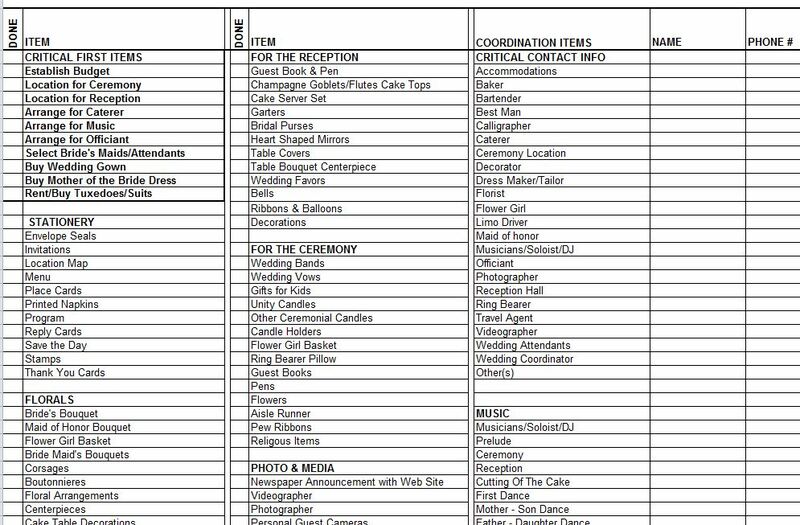 The checklist for your wedding is something that you need to make sure that you have. This is your special day that you will not forget for the rest of your life. If that is something that matters to you, then you are going to realize that you need to make sure that it is completely organized in the way that you have always dreamed of. There is no question that you need to make sure that your wedding checklist has everything you can think of on it. The use of Excel makes the whole process a lot easier for you. The program is probably already on your computer, and it is very simple to learn how to use it. All that you really need to do is make sure that you start checking it out today and get familiar with the program. Your wedding is going to be one of the most important days of your life, so you need to make sure it goes down the way that you want it to. If that is something that you care about, than make sure you are using Excel.